After years of efforts to foment fascism in the United States, Pelly was charged with sedition by federal authorities. Left, his local wanted poster; right, Pelley (in dark jacket) met with a Silver Shirt chapter in Washington state, one of the few hotbeds of his movement. When torch-bearing white nationalists marched in Charlottesville, Virginia, last August, leading to a murder and national soul searching, many shocked Americans asked, “How could this happen here?” Some answers might be found in the story of William Dudley Pelley, who waged a bizarre but partially potent pro-Nazi campaign from Asheville in the 1930s. Long after Pelley’s stab at becoming a “self-styled Hitler,” as one FBI report dubbed him, his place in history is still emerging through documents that were either officially off-limits at the time or tucked away in hard-to-find places. Declassified records, along with a fairly recent biography and a growing online outpouring of historical details, are putting Pelley back in the spotlight and revealing how he made Asheville his headquarters of hate for the better part of a decade. Pelley was “one of the first Americans to create an organization celebrating the work of Adolf Hitler,” historian Scott Beekman noted in his deeply researched biography, William Dudley Pelley: A Life in Right-Wing Extremism and the Occult (Syracuse University Press, 2005). The book describes one of the strangest odysseys to ever take place in American politics. Born to a poor family in Massachusetts in 1890, the energetic and driven Pelley carved out a solid career in the 1920s, first as a journalist and then as a magazine and screenplay writer in Hollywood. In 1928, however, his life was upended by a self-described “ecstatic interlude” while he slept. For what he called “seven minutes in eternity,” Pelley said he left his body and encountered oracles that called him to a greater, spiritualistic mission. 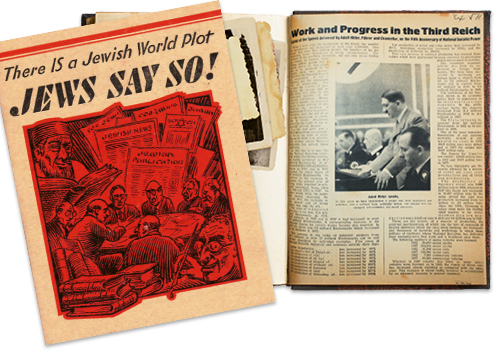 The court records of Pelley’s sedition trial, on file at Buncombe County’s Pack Memorial Library, include numerous examples of the anti-Semitic and pro-Nazi propaganda he either printed in Asheville or shared from his headquarters there. Plunging into metaphysical matters, Pelley built a new following, and in 1930, he migrated to Asheville drawn by support from a wealthy local backer. He formed the short-lived Galahad College, an esoteric women’s school at a choice Charlotte Street address. The project was a flop, but Pelley’s move to establish a printing operation in Biltmore Village proved more successful, especially after he lurched into right-wing politics. The Silver Legion of America, aka the Silver Shirts, was intended to be a “Gentile American Militia,” as Pelley soon put it in the group’s application materials. He envisioned a paramilitary organization that would spearhead a vaguely defined “Christian Commonwealth” in the United States guided by a strange amalgam of anti-Semitism, spiritualism, and blind allegiance to the Silver Shirts. At its roots, Pelley’s movement mimicked Hitler’s, and the Silver Shirts did little to hide their fascist aspirations. Clad in tidy uniforms and forming chapters throughout the country, especially on the West Coast, the group signed up roughly 20,000 members, with untold numbers of sympathizers and a steady stream of invective from Pelley’s multiple publications, most of which were printed in Asheville. 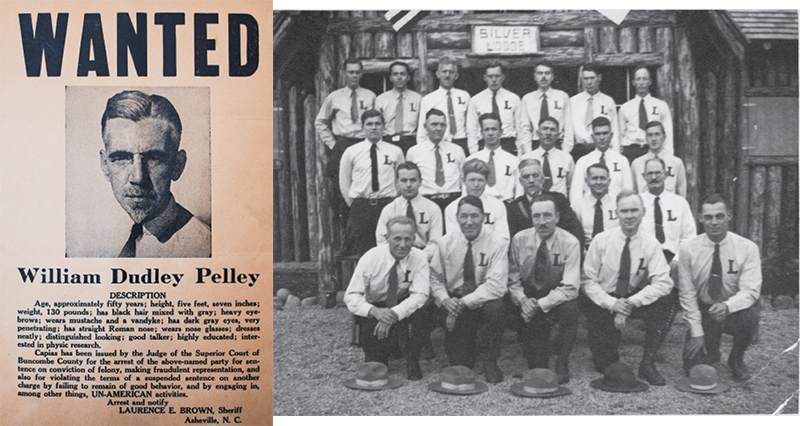 In the mid 1930s, the FBI began investigating Pelley and the Silver Shirts. 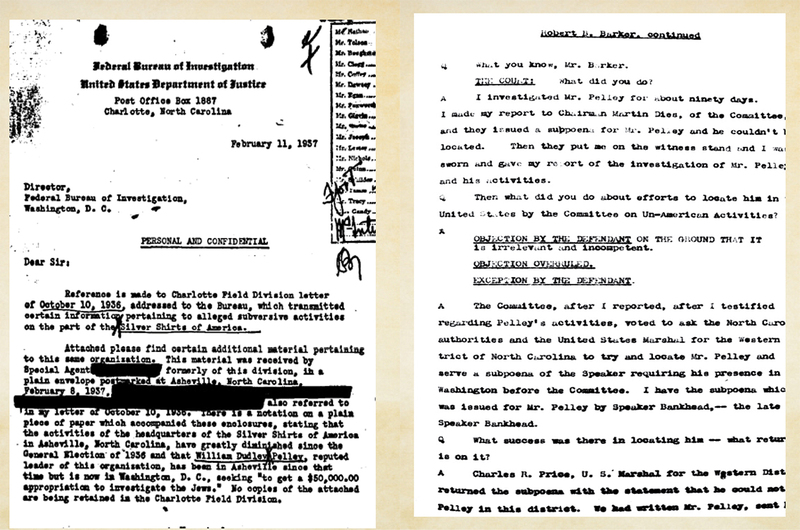 This 1937 document from the bureau’s Charlotte office (left) reported anonymous tips about Pelley from a concerned citizen. Right, a transcript from an FBI agent’s testimony at Pelley’s sedition trial. Pelley’s treasonous run led him to a 15-year prison sentence, which he emerged from early and with characteristic aplomb in 1950. Settling in Indiana, he continued to preach his oddball gospels, now shed of politics and newly framed around UFOs and a theology he dubbed Soulcraft. Photographs (documents and wanted poster) by Andy Ormond, courtesy of the North Carolina collection at Pack Memorial Library; (Silver Legionnaires) courtesy of the University of Washington Libraries, Special Collections, Neg. No. UW39131.